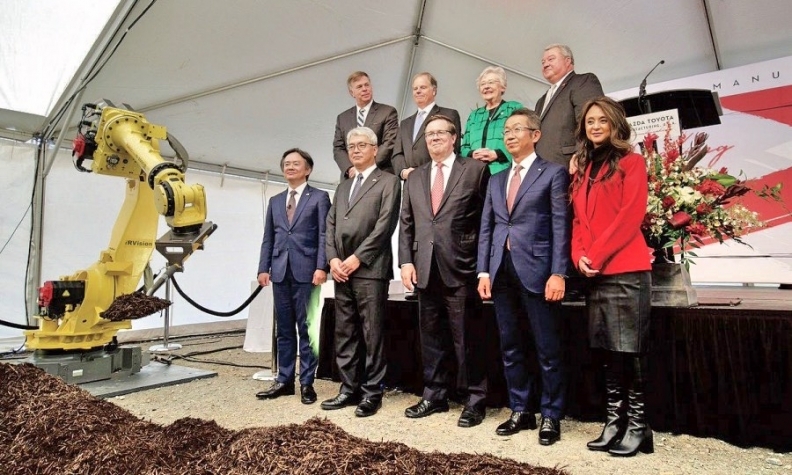 A robot breaks ground for the Alabama plant that Toyota and Mazda plan to open in 2021. Toyota and Mazda broke ground last month for their $1.6 billion assembly plant in Huntsville, Ala. The 3.3-million-square-foot factory, scheduled to open in 2021, will employ 4,000 and initially build a redesigned version of the Toyota Corolla. The plant also will produce an undisclosed Mazda crossover starting that summer. Like all auto plants, the Huntsville project is certain to create economic ripples in the region around it, with suppliers investing nearby and communities reaping the benefits of thousands of families living on new auto industry paychecks. But whether the company — Mazda Toyota Manufacturing U.S.A. Inc. — will operate like Toyota or like Mazda is far from clear. The partners say the project is a 50-50 joint venture, with both companies involved in its development. 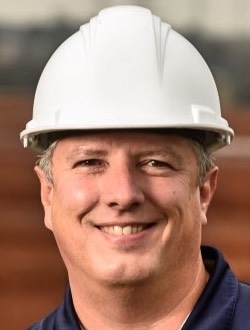 The venture's vice president of administration is Mark Brazeal, 49, a 16-year Toyota executive and Alabama native who worked at Toyota's engine plant in Huntsville. He spoke with Staff Reporter Urvaksh Karkaria about the outlook for staffing and other aspects of opening a large auto plant in a tight labor market. Q: What's the biggest challenge to launching a U.S. auto plant today? A:Job 1 is, of course, the hiring and training of 4,000 new team members. The state of Alabama, through the Department of Commerce, and specifically Alabama Industrial Development Training, will provide direct support to assist us in assessing new-hire candidates and post-hire training. Another major challenge will be supplier sourcing for all the vehicle component parts. We are currently deeply engaged in supplier sourcing. What support will be needed from Alabama or local agencies? First, AIDT will support us in designing and executing our new-hire candidate assessments. Then we plan to specifically use the AIDT Robotics Technology Park near Huntsville to provide technical training and work force development for our skilled labor. The Robotics Technology Park is a tremendous training resource that's close to our plant site and can provide world-class training on robots, robotic systems, programmable logic controller, vision systems and other manufacturing equipment and processes. Was Huntsville's work force, with its depth in advanced electronics and defense work, critical in siting the auto plant? Yes. An evaluation of work force availability and work force capability was an aspect of the site selection criteria. At the same time, we realized we must also begin a process to develop a future work force pipeline, especially for skilled labor. We've already started to collaborate with local high school career tech centers and community technical colleges to engage, recruit and educate the next generation of skilled labor. Is the South, with its many potential sites for greenfield auto locations, at a competitive disadvantage against more industrial corridors of the Midwest and the North when it comes to available skilled labor? Based on national and regional data, there is an overall tight labor market for skilled labor. This is really a common issue across the U.S. The site that was selected for the Mazda Toyota Manufacturing plant was a TVA megasite. Therefore, an existing utilities infrastructure was already in place to support the project although it was a greenfield site. How different will the new plant be from Toyota's other factories in terms of robotics and automation? Due to the very nature of the joint venture between Mazda and Toyota, the new plant will indeed be different than other Toyota plants. There has been a tremendous amount of collaboration between Mazda and Toyota to understand both the commonalities and unique aspects that exist between the two companies' manufacturing processes and equipment. The key point is this plant is not intended to be a copy of other Toyota or Mazda plants. Will this mean more advanced automation? I think the study of both companies' manufacturing processes will result in more advanced technological applications in some cases, while also resulting in less automation in some cases. Decisions are being made in regards to the type, amount and functionality of robotics and other automation. Clearly we want to learn from each other and reflect those mutual lessons into this new plant. Toyota and other Japanese automakers proved that inexperienced North American manufacturing work forces could be trained to build world-class, industry-leading vehicles. Can that magic still happen in a new era of advanced manufacturing? I hate to disagree with the notion that it's magic, but it's really not. It's a result generated from very systematic hiring and human development processes, along with a work force that I certainly respect and greatly appreciate. Having worked in Huntsville at the Toyota engine plant for 16 years, I can attest to the quality of the work force in the North Alabama region. I believe the combination of the existing work force and our post-hire training and human development efforts absolutely will result in producing world-class quality vehicles.